How about another combo pack...Frankenstein in a BYU cheerleader's costume, waving pompoms as he is held in the air by a struggling Miss Devel, also in a cheerleader costume! 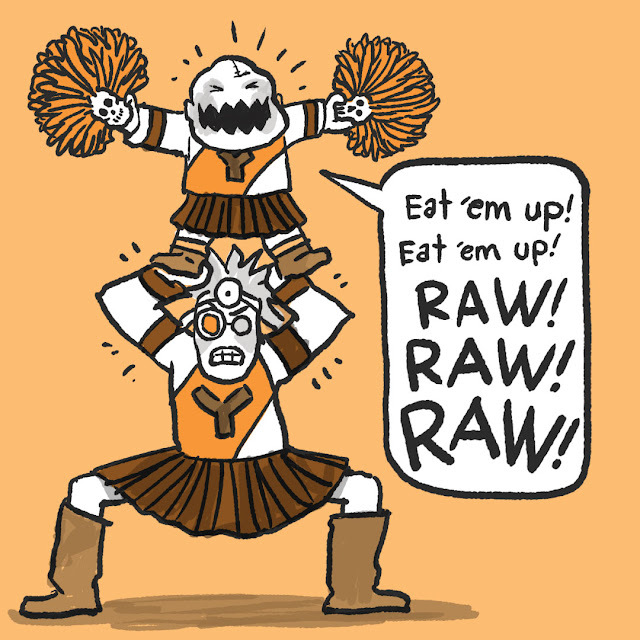 "Eat 'em up! Eat 'em up! RAW RAW RAW!" Inspired by paigeintraining and Laura Z M.
Yay, I'm the first one again. Let's see... Frankenstein in a nest of baby birds, going, "FEED ME! FEED ME!" Fear not, Q. I'll be getting to Taco Hell soon enough. I'm almost finished with my epic bible illustrating job. 116 stories down, 9 to go! I'll be done and blogging Taco stories before you know it. Frankenstein getting a makeover done by Tyra Banksenstein.